PRL Info Systems is the corporate identity behind the Pimarc suite of project management software products. Pimarc’s project management software was born from the needs of Holstead & Redmond Limited, a land surveying company that has been operating in London, Ontario for over 50 years. Holstead & Redmond works on a daily basis with land surveyors, engineers, architects and found themselves faced with the challenge of managing and accessing a growing survey record index (SRI). When the company couldn’t find a project management system to meet their needs, they decided to create their own. From this growing need, the software was expanded and refined until it was made commercially available in 2004. This new software was quickly adopted by other land surveying companies who were facing similar challenges of their own. Today, Pimarc’s software products are used by land surveyors, engineers, and architects across Canada and the US to make their businesses operate more efficiently. Holstead & Redmond continue to serve as Pimarc’s “live laboratory” and testing ground for new features and additions to the Pimarc software. This ensure that Pimarc’s project management software products meet the real world needs of land surveyors, engineers and architects. 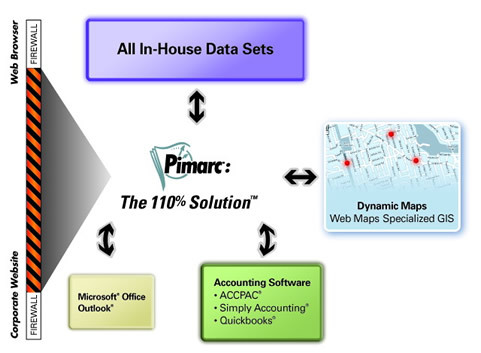 Pimarc is a secure web-based application and integrates seamlessly with a variety of other software applications and data sets. In addition to Pimarc project management software, PRL Info Systems also offers a full range of project management services including workflow analysis, expert consulting, data transfer and document scanning, outsourced project management services and more.